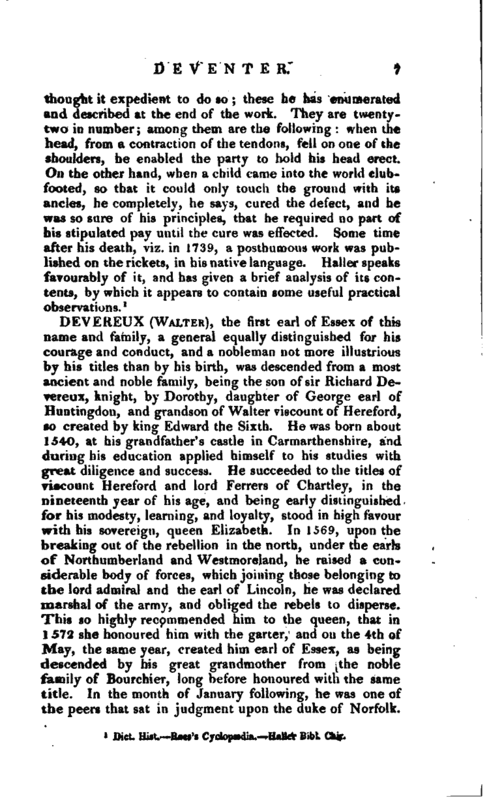 , the first earl of Essex of this name and family, a general equally distinguished for his courage and conduct, and a nobleman not more illustrious by his titles than by his birth, was descended from a most ancient and noble farrr!“, being the son of sir Richard Devereux, knight, by Do ‘thy, daughter of George earl of Huntingdon, and gra.idson of Walter viscount of Hereford, so created by king Edward the Sixth. He was born about 1540, at his grandfather’s castle in Carmarthenshire, and during his education applied himself to his studies with great diligence and success. He succeeded to the titles of viscount Hereford and lord Ferrers of Chartley, in the nineteenth year of his age, and being early distinguished for his modesty, learning, and loyalty, stood in higii favour with his sovereign, queen Elizabeth. In 1569, upon the breaking out of the rebellion in the north, under the earls of Northumberland and Westmoreland, he raised a considerable body of forces, which joining those belonging to the lord admiral and the earl of Lincoln, he was declared marshal of the army, and obliged the rebels to disperse. This so highly recommended him to the queen, that in 1572 she honoured him with the garter, and on the 4th of May, the same year, created him earl of Essex, as being descended by his great grandmother from the noble family of Bourchier, long before honoured with the same title. In the month of January following, he was one of the peers that sat in judgment upon the duke of Norfolk. | At this time he was such a favourite with the queen, that some, who were for confining her good graces to themselves, endeavoured to remove him by encouraging an inclination he shewed to adventure both his person and fortune for her majesty’s service in Ireland. Accordingly, on the 16th of August, 1573, he embarked at Liverpool, accompanied by lord Darcy, lord Rich, and many other persons of distinction, together with a multitude of volunteers, who were incited by the hopes of preferment, and his lordship’s known reputation. His reception in Ireland was not very auspicious landing at Knockfergus on the 16th of September, he found the chiefs of the rebels inclined apparently to submit; but having gained time, they broke out again into open rebellion. Lord Rich was called away by his own affairs, and by degrees, most of those who went abroad with the earl, came home again upon a variety of pretences. In this situation Essex desired the queen to carry on the service in her own name, and by her own command, though he should be at one half of the expence. Afterwards he applied to the earls of Sussex and Leicester, and the lord Burleigh, to induce the queen to pay one hundred horse and six hundred foot; which, however, did not take effect; but the queen, perceiving the slight put upon him, and that the lord deputy had delayed sending him his commission, was inclined to recal him out of Ulster, if Leicester and others, who had promoted his removal, had not dissuaded her. The lord deputy, at last, in 1574, sent him his patent, but with positive orders to pursue the earl of Desmond one way, while himself pressed him another. The earl of Essex reluctantly obeyed, and either forced or persuaded the earl of Desmond to submission; and it is highly probable, would have performed more essential service, if he had not been thwarted. The same misfortune attended his subsequent attempts; and, excepting the zeal of his attendants, the affection of the English soldiers, and the esteem of the native Irish, he gained nothing by all his pains. Worn out at length with these fruitless fatigues, he, the next year, desired leave to conclude upon honourable terms an accommodation with Turlough Oneile, which was refused him. He then surrendered the government of Ulster into the lord deputy’s hands, believing the forces allowed him altogether insufficient for its defence; but the lord deputy obliged him to resume it, and to majrch against Turlough, | Oneile, which he accordingly did; and his enterprize” being in a fair way of succeeding, he was surprized to receive instructions, which peremptorily required him to make peace. This likewise he concluded, without loss of honour, and then turned his arms against the Scots from the western islands, who had invaded and taken possession, of his country. These he quickly drove out, and, by the help of Norris, followed them into one of their islands; and was preparing to dispossess them of other posts, when he was required to give up his command, and afterwards to serve at the head of a small body of three hundred men, with no other title than their captain. All this he owed to Leicester; but, notwithstanding his chagrin, he continued to perform his duty, without any shew of resentment, out of respect to the queen’s service. In the spring of the succeeding year he came over to England, and did not hesitate to express his indignation against the all-powerful favourite, for the usage he had met xvith. 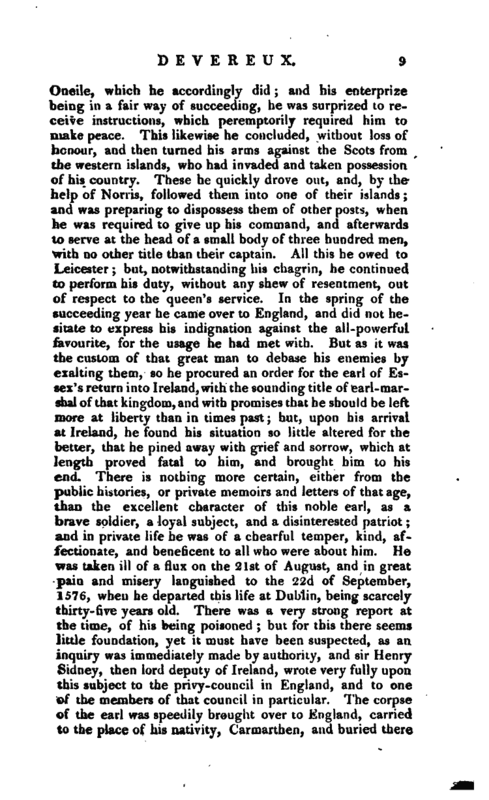 But as it was the custom of that great man to debase his enemies by exalting them, so he procured an order for the earl of Essex’s return into Ireland, with the sounding title of earl -marshal of that kingdom, and with promises that he should be left more at liberty than in times past; but, upon his arrival at Ireland, he found his situation so little altered for the better, that he pined away with grief and sorrow, which at length proved fatal to him, and brought him to his end. 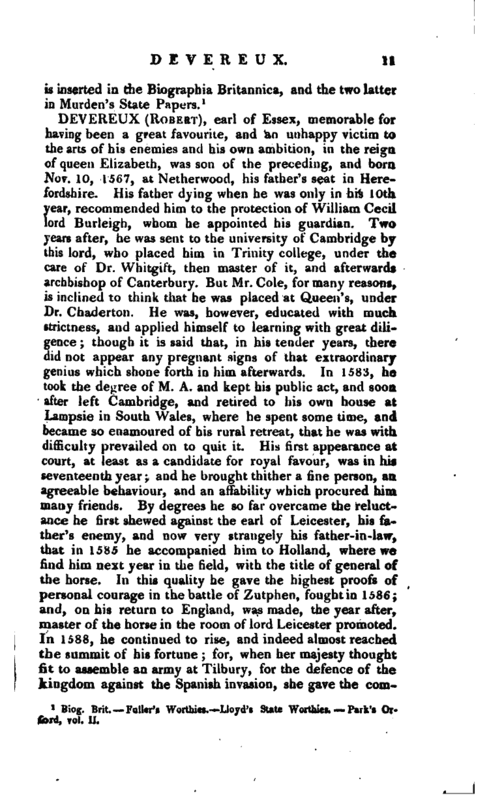 There is nothing more certain, either from the public histories, or private memoirs and letters of that age, than the excellent character of this noble earl, as a brave soldier, a loyal subject, and a disinterested patriot; and in private life he was of a chearful temper, kind, affectionate, and beneficent to all who were about him. He was taken ill of a flux on the 21st of August, and in great pain and misery languished to the 22d of September, 1576, when he departed this life at Dublin, being scarcely thirty-five years old. There was a very strong report at the time, of his being poisoned; but for this there seems little foundation, yet it must have been suspected, as an inquiry was immediately made by authority, and sir Henry Sidney, then lord deputy of Ireland, wrote very fully upon this subject to the privy-council in England, and to one of the members of that council in particular. The corpse of the earl was speedily brought over to England, carried to the place of his nativity, Carmarthen, and buried there | with great solemnity, and with most extraordinary i< monies of the unfeigned sorrow of all the country round about. A funeral sermon was preached on this occasion, Nov. 26, 1576, and printed at London 1577, 4to. He married Lettice, daughter to sir Frances Knolles, knight of the garter, who survived him many years, and whose speedy marriage after his death to the earl of Leicester, upon whom common fame threw the charge of hastening his death, perhaps might encourage that report. By this lady he had two sons, Robert and Walter, and two daughters, Penelope, first married to Robert lord Rich, and then to Charles Blount, earl of Devonshire; and Dorothy, who becoming the widow of sir Thomas Perrot, knight, espoused for her second husband Henry Percy earl of Northumberland. 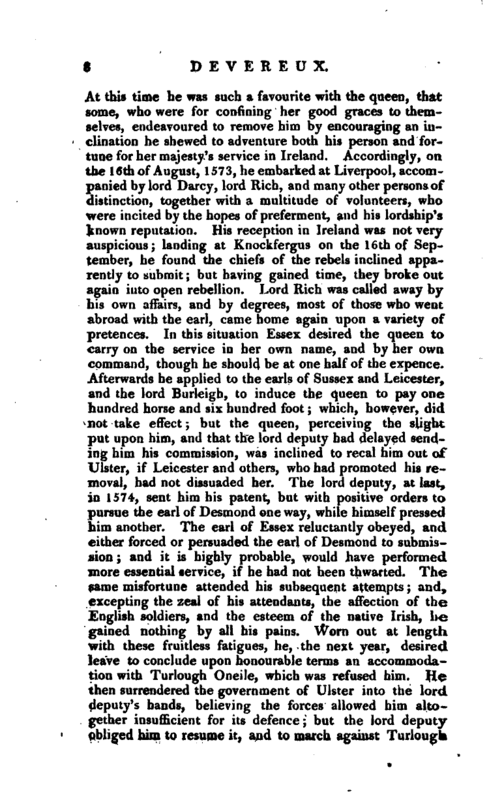 One important objection only has been brought forward against the character of the first earl of Essex, which is mentioned by Dr. Leland, in his History of Ireland. The story, as literally translated by Mr. O’Connor, from the Irish manuscript annals of queen Elizabeth’s reign, is as follows: “Anno 1574. A solemn peace and concord was made between the earl of Essex and Felim O‘Nial. However, at a feast wherein the earl entertained that chieftain, and at the end of their good cheer, O’Nial with his wife were seized, their friends who attended were put to the sword before their faces. Felim, together with his wife and brother, were conveyed to Dublin, where they were cut up in quarters. 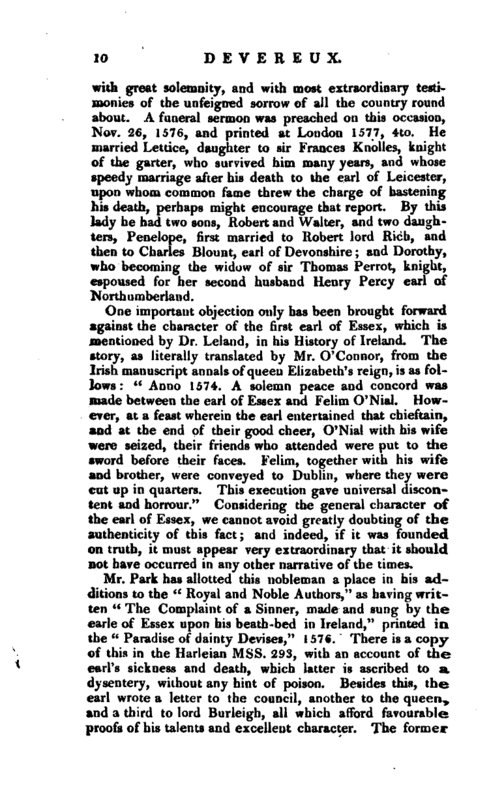 This execution gave universal discontent and horrour.” Considering the general character of the earl of Essex, we cannot avoid greatly doubting of the authenticity of this fact; and indeed, if it was founded on truth, it must appear very extraordinary that it should not have occurred in any other narrative of the times. Biog. Brit Fuller’s Worthies. Lloyd’s State Worthies. Park’s Orford, vol. II.